Where is My Jumping to Conclusions Mat? I have written before about the dangers of eavesdropping and making assumptions. I now turn to a favorite movie, Office Space, to illustrate the dangers of jumping to conclusions when you are a school psychologist. 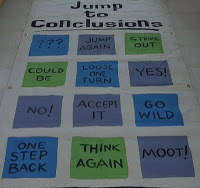 I really could have used this mat the other day to remind myself how lame it is to jump to conclusions. In the words of Tom Smykowski, from the movie Office Space: “You see, it would be this mat that you would put on the floor… and would have different CONCLUSIONS written on it that you could JUMP TO.” Brilliant. Not knowing much about gangs and how they all work, I strive to have the kids explain it without jumping to my own conclusions. With each student I talk with, I learn a bit more about the intricacies and inter-workings of gang recruitment in middle and high school–the difference between “being jumped” and “being jumped into,”* the differences between wearing a red belt and wearing a red belt, and the tragedy when a kid “dies for a color.”Gang life is so ingrained in the culture of my students, whether they are in a gang or not. It even filters down to tagging graffiti in the name of Obama. Back to my tale of jumping to conclusions. I suppose that after 56 years** of working as a school psychologist in large urban school districts, the frame of gang prevention is thoroughly engrained in me. This is why when I learned that one of my high school students I am counseling jumped another one of my high school students I am counseling into a gang over the holiday, I freaked out. And I’m pretty unfreakoutable. I had been talking to both of them about the decisions they had to make about pursuing their goals or joining a gang. Both were teetering on the edge of joining and felt trapped. One kid was possibly already affiliated but afraid to tell me. When I first heard about the jumping in incident, I jumped to the conclusion that these kids were now mixed up in something deadly and freaked out. Luckily, I was scheduled to see both of them that day. I pushed my freakoutdeness aside and calmly asked each of them separately, “So, what’s new?” And then I listened. I can’t go into detail and I’ve changed some of the language because of confidentiality, but I will say that my freak-out level was significantly reduced when I found out what “gang” it was. It was S.O.J. Let’s take a moment to ponder the interworkings of 9th grade minds constantly exposed to gang life. Instead of forming a soccer club or team of some sort, they decided that the best way to prove you loved soccer was to beat up new members. I bet the higher ups are wishing they didn’t give the soccer team the axe in budget cuts now. There isn’t a real moral to this story, other than the obvious one: really listen to your students and not make assumptions about their behavior until you have their perspective. Was it wrong to beat someone up? Yes. Was the intention misguided? Yes. Are these juvenile delinquent gang kids? Not at this time…I hope. Maybe I’m naive, but I feel that what they truly want is to belong and have support. My interventions with these kids is going to be far different than the one I would have done had I used my “jumping to conclusions mat” and decided they were gang members. We’ll start with learning how to start a club appropriately and figure out how to get soccer back in their lives. *From what I’ve gathered, “being jumped” is basically being beat up for the purpose of injury, to settle a score, or to get your money or property, and “being jumped in” means that you get beat up by the gang to prove you’re worthy of being in the gang. This is the filtered version from the perspective of a suburban white girl. I’m sure it’s more complex than that. **Each year is a dog year of learning, so technically, I’m on year 8. Comments on Where is My Jumping to Conclusions Mat? I am a student at Kent state university and I am commenting on blogs about education so I have a feeling for a professional experience dealing with education.I think it is quite interesting how you can make a reference to a popular movie and turn it into a significant tool about jumping to conclusions. I agree one can not always jump to conclusions. Many rumors can be spread and whether it is about gang's, gang violence, or more minor issues rumors can cause a lot of problems and It is great that school psychologists such as yourself can help with such serious issues because who else would? I am also a student at Kent State doing the same thing, weird we came across this same blog. I’m glad I came across this blog. Most teachers or higher officials claim that they never 'make assumptions’ about their students but we all know that they all do. I like that you pointed out that you may not know exactly what the students in the 'gangs' are going through or exactly what their 'gang' is. But you took the time to figure it out, and talk to them. I know it's your job to counsel the students, but I think teachers need to do this more often. Instead of labeling the students that are 'gang members' as the 'bad kids', get to know them instead. These kids may have many reasons as to why they are in the gangs, like fear of their gang members, home life, etc. You will never know what their situation is if you automatically label them, without taking the time to figure it out. I always get the "look" from teachers when I refuse to jump to conclusions…well you know that student is probably mentally retarded, emotionally disturbed…take your pick. So hats off to your cautious approach and realization that jumping to conclusions can be a dangerous game.